The company was established in 2004. 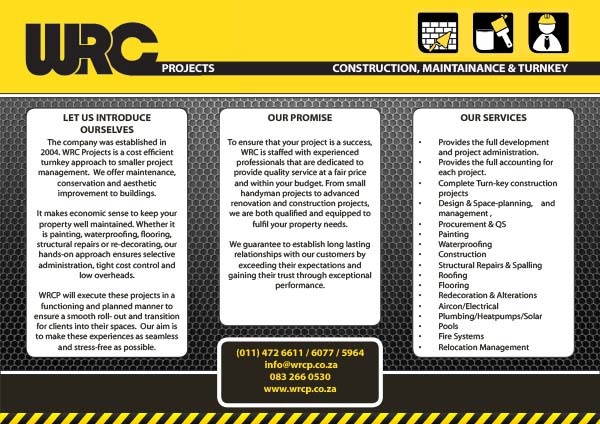 WRC Projects is a cost-efficient turnkey approach to smaller project management. Our vision is to embrace expansion in our industry with innovation and expertise to become an industry leader in our sector and to always deliver a final result with resourceful quality in a timely manner with the ultimate goal of client satisfaction. #Quality #Service #Price – that is the cornerstone of our successful construction and property development company. We offer maintenance conservation and aesthetic improvements to buildings. We provide full development and project administration. Provide full accounting for each project. Complete turnkey projects. Design & management of Space-planning. Procurement and QS. Painting, waterproofing, Construction, Structural repairs and spalling, roofing, flooring, redecoration and alterations, Aircon/electrical, Plumbing/Heatpumps/Solar, Pools, Fire Systems and relocation management. © 2019 WRC Projects. Portal powered by Specifile®.